Angels lefty Tyler Skaggs is 2-0 with a 3.34 ERA this season. 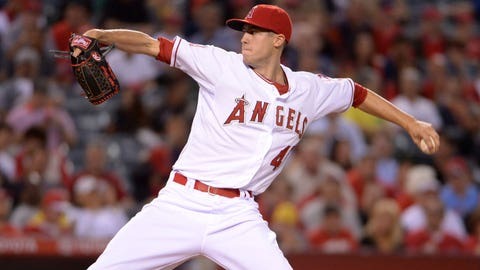 Tyler Skaggs was re-acquired by the Angels in the offseason after being traded by the organization that made him a first round pick out of Santa Monica High School in 2009. So far in this stint with the Angels the 22-year-old left hander is 2-0 with a 3.34 ERA. Perhaps equally impressive is the Angels are 5-0 in his starts this season. He’s the fourth lefty in club history to have the team win each of his first five starts joining Bo Belinsky, Jarrod Washburn, and Scott Schoeneweis. Meanwhile, here’s 10 things you many not know about him. If you ask Skaggs his nickname, he’ll tell you he doesn’t have one. But fellow pitcher C.J. Wilson chimed in, saying the team was working on a couple for him. "T-Swags or Swaggy T," Wilson said. Skaggs has always excelled in baseball but his heart was always on the hardwood. "I wanted to be a basketball player, I mean, I still want to be a basketball player but I think that dream is finally over," Skaggs admitted. "I’m more of a forward type of guy. I’m not the greatest dribbler but I can shoot." The former Santa Monica High School star is no stranger to the beach and likes to get there as often as he possibly can. "I’m a beach bum," he said. "I like to go paddle boarding (and) doing all that kind of stuff." "Because I’m always in the ocean," he said. Without question, for Skaggs, it’s enchiladas. "My mom’s Mexican so she cooks a lot of Mexican food," he said. If it’s late and Skaggs is looking for a snack, he isn’t very selective. "Just leftovers from dinner, honestly," he said. "Whatever I don’t eat that night I, kind of, reheat it up and eat it." "That’s my guy right there," Skaggs said. For that, Skaggs goes with "Friday." Like many others he’s specific. "The Original Friday," he said. "Not the (others)." Skaggs wore No. 37 with the Diamondbacks. In high school he wore No. 11, which is his favorite number, but that number is retired by the Angels, worn by the late Jim Fregosi. 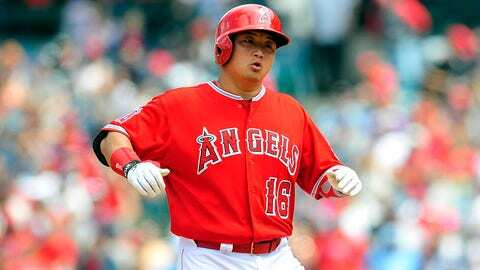 In this, his second stint in the Angels organization, he decided to go with No. 45. "I’m a big Michael Jordan fan and I figured since he went away and then came back and wore No. 45, I think it’s fitting that I went away and I come back and come back strong with a strong number," Skaggs explained.